Lindberg are a Danish eyewear manufacturer offering designer glasses, sunglasses and fashion frames for both adults and children that specialize in lightweight titanium and acetate plastic frames. With many frame designs, as well as custom fitting, multiple colour options, and multiple lens shapes, Lindberg’s innovative eyewear system makes it possible to put together a unique and personal frame to suit the wearer in terms of every design aspect. For both men and women with discerning, minimalistic style, Lindberg glasses use modern design, breath-taking innovation, and unparalleled durability in each frame. 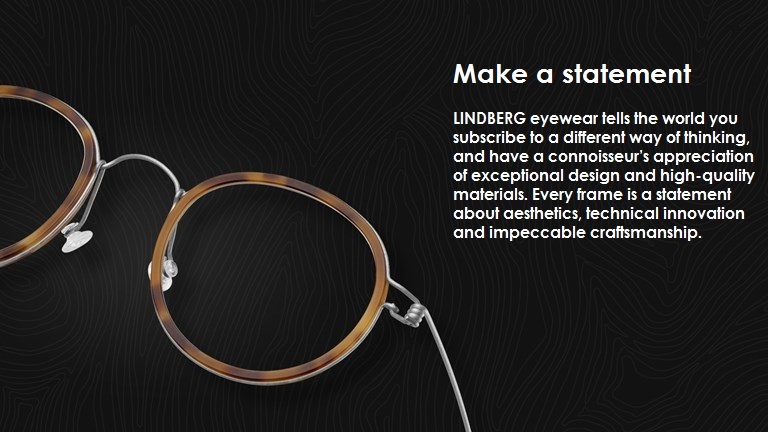 LINDBERG eyewear tells the world you subscribe to a different way of thinking, and have a connoisseur’s appreciation of exceptional design and high-quality materials. Every frame is a statement about aesthetics, technical innovation and impeccable craftsmanship.